SMP, aka trichopigmentation is a cosmetic procedure that effectively creates the appearance of having more hair or even a full head of hair. It involves very minimal discomfort or downtime after the procedure and is well tolerated by patients who have the procedure. 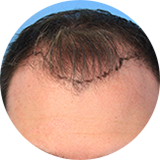 Once the procedure is complete, the patient will have the appearance of a fuller, and thicker, head of hair or the appearance of a closely shaved head. If a patient experiences any kind of pigment fading, or they decide they want a different pigment shade, they can always get a touch-up procedure. You need to know what to expect after an SMP procedure and also follow certain instructions after your procedure for the best results. No particular care is needed following the first week and patients can do all physical activities with no restrictions. The SMP procedure implants dermal pigments on the very superficial layer of skin and that is why its result is reversible. That means over time, and with turnover of the scalp skin cells, SMP may become lighter in color. As the older superficial layers of skin are replaced with the newer ones, pigments will shed as well. That is the reason for any lightening of SMP color after the first year. It is recommended to get a touch-up procedure every year to keep the color consistent and also to keep it looking completely natural at all times.